True custom built craftsman style cottage! Builders personal home. Lush landscaping on corner lot on quiet cul-de-sac street. One of the most popular streets. Front porch waiting for you swing. Cement board siding and brick. Perfect starter home or retirement retreat. Water system for the lawn. Community has park, ball field, gazebo, alleyway driveways, green spaces, and historic nursery community center. Perfect for graduations and weddings! ROCKWELL schools. Fresh paint inside and out, fans, hardware, stainless appliances, granite sinks and more! 5 burner gas stove with pot filler. Oversize laundry room with soak sink, cabinets, and folding counter. 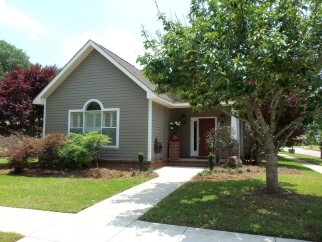 Master bath has separate garden jetted tub, water closet, separate shower and custom closet! Slick 9' ceilings. Custom gas fireplace in large great room. Blinds and shutters throughout. Community also has access to church, restaurants, gas station and nursing home. Park your car and bike. Refrigerator, washer and dryer included. 2 car garage. NO CARPET!